I just finished an article on role-play I have been struggling with since June. It has been delayed, lost, stolen and now finally finished. I am so done. Now it's up to the editors to say if the like it or not. To my eye it looks fragmented and sparse, as it is at least 5 pages shorter than I had planned. Hopefully it will appear economical and clear. Who knows. In my present state of mind, I don't. All I can think of is that this is the right moment for the bottle of champagne in the fridge, from the duty-free shop in Oslo. agirra, originally uploaded by Rotill. Jill posted about the character on Runetotem, with a pretty little screenshot. But I happen to like the background of the orc better. 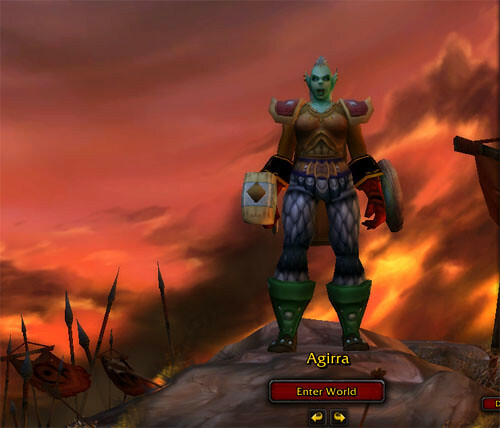 Red and orange, wartorn and on fire, Agirra stands in the Barrens against a backdrop of blood and smoke, nothing of the cute human order and prettyness. She is fighting for a peaceful slice of the desert: some sand, sun and scorpions for the orcs to live amongst and not be manipulated by warlocks or captured and killed by humans. And yes, I think the flags and the hill connote the pictures from the French revolution, rising the red flag on the barricades. Makes me like it even more. I decided to attend to State of Play III, as I am in New York anyway, and the fee is manageable. But I am afraid to say that judging from the program so far, I can't see me crossing the Atlantic for it. I guess I may not be the target group, though, as I am not all that interested in the stock market and the connection to games, I am not invited to any of the workshops, and I heard several of the panelistslast year and in different conferences. I will still be there though, and I will be hoping for a pleasant surprise, such as a sudden surge in female game scholars and professionals on the panels (to be fair, there is one woman on almost every panel), or that some of the people I have not heard of or heard before can provoke the people I have heard several times now into new thoughts and insights to share with us, the attendants. Last year was interesting and educating, and this year may prove to be the same. I will let you all know - if they have the same good wifi connection as last year, you will know it instantly if I reach an epiphany during this! Erling asked about a political stance on the New Orleans event. I am definitely not going to declare myself on that, as I know way too little about what was going on. But by way of a quote by Francis, I got to New York times, and their headlines today are clearly critical of the way the crisis was handled. What Erling wanted to hear is definitely being said. This household is perpetually jet-lagged, which is why I get along so well with my NYC connection on these trips. At 5 am this morning we were both up, making breakfast, drinking tea and coffee, planning the day. And so I can blog at 7.30 after a couple of hours of setting everything up for an efficient Friday. Today I am starting the actual writing of an article about role-play and the other. A lot of the preliminary work on that was lost to the person who now has my computer (and may it crash on you), so I have had to start the outlining all over again. One result of that was that I didn't get the right books with me from Norway. So yesterday was spent book-hunting in used book stores for duplicates of books I have in Volda. I found several at Mercer Street used Books and Records Store, nothing at Strand, despite the 18 miles of books, and the last couple of copies at full price at Barnes and noble. Those I will have to donate to some worthy cause when I get home, like the library. Or perhaps leave them here, for later emergencies. I also contacted Mary Flanagan, who saves me from more book hunting by letting me borrow a couple of books from her, and so the stack has risen to a comfortable height and I feel confident that I get my references right. There is something so very soothing about first-hand references, and not trusting other people's citations. I make enough errors on my own, thank you. By way of a comment from Thomas, I found Nerd-TV. Isn't this just what we have been waiting for? To have a channel where Douglas Engelbart, Linus Torvalds and Steve Wozniak can answer the intelligent and important questions in life? I guess I am a nerd, because I love the idea. I just wish there would be more like this: I want nerds of all persuasions to have a channel dedicated to their topic and their gurus. 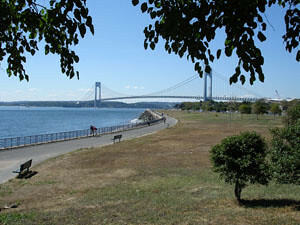 I am in New York, me and the new lap-top and a new camera, it's really warm so I can walk around in a T-shirt and a skirt without getting serious infections, and stress is evaporating in the heat. I have been playing WOW with Jill and Hilde, exploring the power of friends to hunt next to, a social experience as well as a powerful one: the group gives confidence. Now excuse me, I have to start doing some serious playing, thinking and writing. Back later with examples on how the camera works.